Yiddish literature thrived for centuries in Poland. Despite many obstacles it found a new life after the horrors of World War II but its end came suddenly and unexpectedly – in March 1968. It’s a rare occurrence that one can pinpoint with precision a moment in time when a whole strand of world literature came to an end. For Yiddish literature in Poland this happened sometime in the year 1968 and was linked to a purely political decision. The anti-Semitic propaganda which was unleashed that year by the communist government resulted in the expulsion or compulsory emigration of almost all of what was left of Polish Jewry after the Holocaust. In its aftermath, some 15,000 Polish citizens – among them the last of the Polish Yiddish authors and readers – emigrated from the country. But, going back in time, the fascinating story of Yiddish literature in Poland was full of surprising turns of events – for one, it’s a story that almost ended decades earlier. The history of Yiddish literature in Poland goes back to the 16th century when the first book in Yiddish was printed. In the following centuries Poland and, later, the former territories of the Polish-Lithuanian Commonwealth (Lithuania, Belarus and Ukraine) became the centre of the world’s blooming and vibrant Jewish Ashkenazi civilisation. It brought about diverse and fascinating literature written in Yiddish, a Germanic language of Eastern European Jews, with components from Hebrew and Slavic languages . Yiddish literature spanned different traditions: from oral literature (with its popular songs and fables), to Hasidic writings (the most famous of which are the teachings of Bal Shem Tov and Reb Nachman of Bratslav) and the Haskalah to modernity – the latter represented by such classics as Mendele Moykher Sforim, Sholem Aleichem and Itshak Leybush Peretz. This evolution culminated in the works of Yiddish modernism and avant-garde of the interwar period – a period which would spawn such writers as the Nobel Prize-winner Isaac Bashevis Singer or Avrom Sutzkever. And yet this multifaceted and diverse history almost ended with World War II as the vast majority of Jews in Eastern Europe perished in the Holocaust. How was it possible that despite being decimated by war, Yiddish cultural life in post-war Poland was reborn? As Magdalena Ruta, a scholar of post-World War II Yiddish literature and author of the book Without Jews, argues, this happened to a large extent thanks to the will and efforts of a handful of Holocaust survivors. Active before the war as Yiddish writers and journalists, this group of people engaged in an effort that resulted in reviving Yiddish press and literature, with Jewish life and language once again teeming in Warsaw and Łódź, but also in places where it had never been particularly notable, such as Wrocław and Szczecin, as well as the small towns of Lower Silesia – in the so-called ‘Recovered Territories’ in what was now Western Poland. How was it at all possible? Just a comparison of the names of writers active in Poland immediately after the war – Chaim Grade, Rachel Korn, Rejzl Żychlinska, Avrom Sutzkever, Moyshe Knapheys, Khaim Leyb Fuks, Awrom Zak – with what was published after 1949, speaks for itself. This early post-war period was also, as Magdalena Ruta writes, a time of relative pluralism in the socio-political and cultural life in Poland under the communist regime. Very soon, however, a more uniform ideological profile of the new Yiddish culture in Poland began to emerge. This new model was formulated by Holocaust survivors – many of whom had been communist activists before the war and ardent supporters of the communist regime after the war. A programme was officially announced at the congress of the Association of Jewish Culture (Towarzystwo Kultury Żydowskiej) in October 1949 in Wrocław. It was then that socialist realism was established as the only acceptable creative method in various fields of culture and arts – a programme that did not differ essentially from that imposed on authors of Polish-language literature. But how did this revival of Yiddish cultural life in Poland come about in the first place? And how was it possible – in a country, which at the time, seemed like a graveyard of Jewish life and civilisation? The Holocaust and its aftermath must have inevitably raised questions as to the very idea of the continuation of Yiddish culture in Poland: Was it worth writing again in Yiddish after all that had happened? Was it worth building on these ruins? Ruta explains that those who survived didn’t share these doubts at all. For them Yiddish was their mother tongue, a language that was absolutely natural in the daily life of Poland. 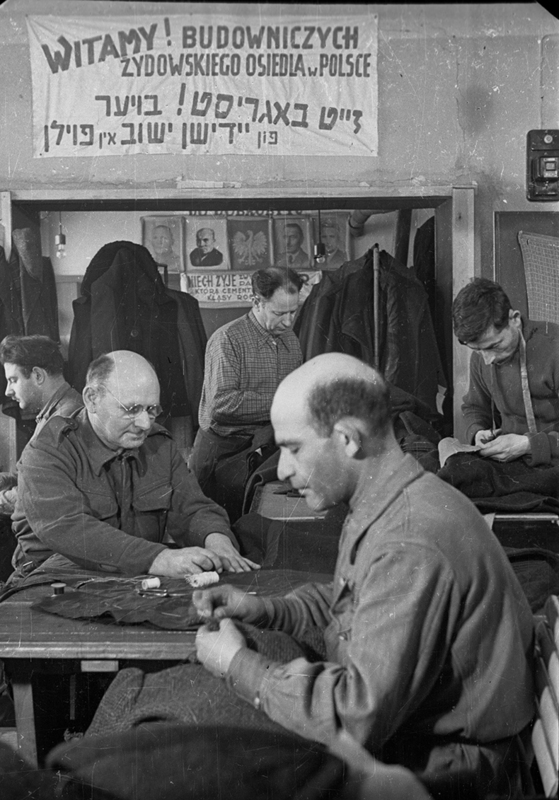 For many of the survivors Yiddish also remained their first language of communication after the war. Yiddish was simply the language of a great majority of Holocaust victims. In a metaphorical and literal sense, the language itself became the victim of the Shoah. Hence, on the one hand, the survivors had the sense of a special mission, a sense of a moral obligation to continue Yiddish cultural life whose evolution was so tragically interrupted by the Holocaust. On the other hand, there was a feeling, which accompanied many of the writer-survivors, that Yiddish had, in a way, become sacred language. It is clear that after the Shoah there was no development ahead of the Yiddish language. And yet here is the language manifesting itself anew. (...) Yiddish is becoming a new sacred language – and the sacred language can exist and create values without material roots. This sacred language lives not on some material basis but in the heart, and especially in the memory of the nation. Thanks to this power Yiddish literature will live on. This fate connects Yiddish literature in all countries. This fate and this power create anew a single, world literature of the Yiddish language, in which survivors – authors of Polish-Yiddish literature – occupy a key place, regardless of where they will continue their work. This shadow of the Shoah is noticeable in the recurrent themes [of this literature], such as the constant reflection on how the dear ones perished, a feeling of guilt caused by the fact that one was not present in the hour of their death, incessant struggling with God about the lack of interference in history, a call for revenge on the Germans, accusations hurled at the world’s indifference, and so on. The return to Poland of those who survived the war in the USSR and their realisation of the scope of destruction dealt to the Jews, engendered an urgent need to bereave the dead and attest to their fate, as well as strive towards a revival of Jewish life and culture. For many authors, their decision to stay in Poland and take part in the effort of recreating Jewish culture, along with taking care of Jewish graves, was a sort of moral imperative. One of the important phenomena of Yiddish literature written after World War II was that this new Jewish life in Poland was, to a large extent, shaped by the Jews who survived the war in the USSR. Most of these survivors, referred to later by Julian Stryjkowski as those ‘saved in the East’ (‘ocaleni na wschodzie’), including the most important figures of Polish Yiddish culture to come, like Hersh Smolar or David Sfard, had either communist or leftist sympathies. I believe that it is precisely this experience – not directly bearing witness to the evils of the Holocaust in the territories occupied by the Germans and the participation in the life of a large nation, whose Jewish inhabitants were not only the victims of the German invaders but also actively fought against the aggressors in the Red Army – must have taken its toll on the psyche of those ‘saved in the East’. This must have engendered various tensions and misunderstandings between the survivors in post-war Poland. It also had a direct impact on literature, resulting in a series of works that extolled the fighters of the Warsaw Ghetto, while at the same time reproaching the masses that went to their doom without a fight. 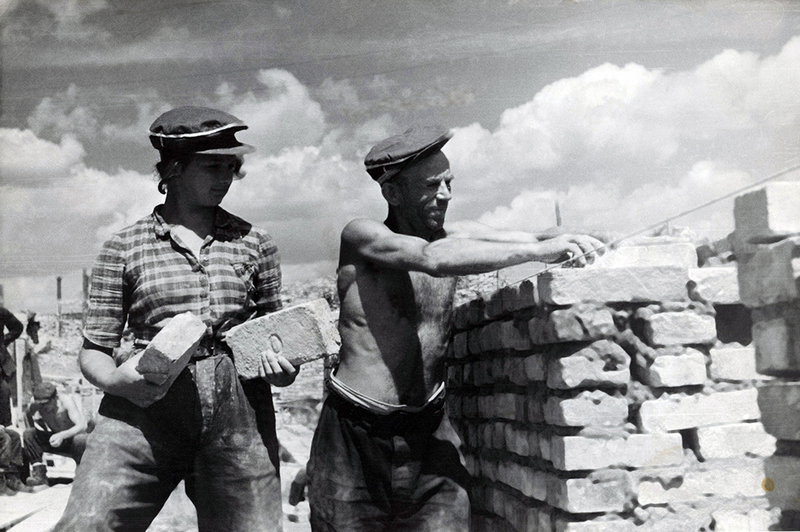 The other important theme of post-war Yiddish literature was that of building a new communist world. Yiddish literature, just as Polish literature of the Stalinist era, was devised as a tool of building a brave new world and the formation of a ‘New Man’: an active internationalist, an effective industry worker, working for the sake of his social class. 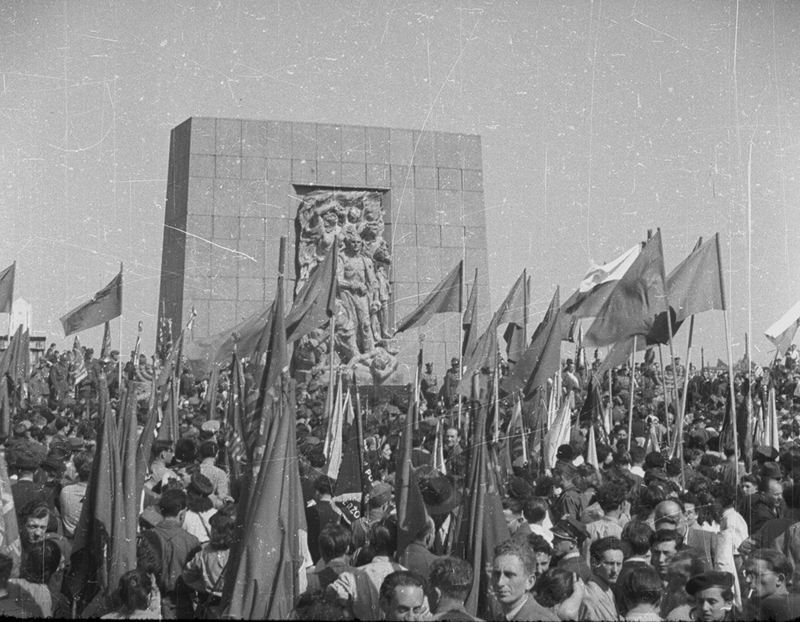 This variant of social realism – with its typical themes of extolling the new communist world with its great construction projects, industry and collectivisation, hailing Stalin or Bierut, and criticising the enemy, that is the imperial, capitalist states – was however, in its most zealous, revolutionary form, limited to the short period of time between 1948-1955. And even then, a ubiquitous sense of mourning present in the writings of Yiddish authors was something that caused great discomfort on the part of regime critics. This social realist positivism would soon disappear almost entirely. As Ruta puts it, the politics succumbed to the mourning, which was a shared experience of all Jewish authors. In the 1950s and 60s Yiddish literature once again saw a period of bigger thematic diversity: from the reckonings with Stalinism and polemics with Polish anti-semitism, to a new interest in the Land of Israel and an evolving attitude towards the Holocaust, with important contributions from Lili Berger and Kalman Segal. Segal who was bilingual and, during his heyday, a very popular writer, was the author of stories and novels in which he depicted the no longer extant world of his hometown Sanok. His output as a whole can be seen as a reflection of his complex Polish-Jewish identity. Apart from the Holocaust, one of the most important questions for many of Yiddish authors in post-war Poland was: What does it mean to be a Jew in post-war Poland? A country marked by the Holocaust, post-war pogroms and instances of aggression towards the Jews who returned, but also a place which for centuries was home to many generations of Jews. And last, but not least: What does it mean to be a Jew in a country where Jews are no more? These questions returned in many texts written by Yiddish writers. Along with the most bitter reckonings with Polish-Jewish history, they featured in the poems written when facing ultimate emigration. These farewell poems and texts started appearing as early as 1946, when the first group of writers, with arguably the greatest of them Avrom Sutzkever and Reyzl Zychlinski, decided to leave the country, and continued to appear throughout the whole of of Yiddish literature’s post-war period. 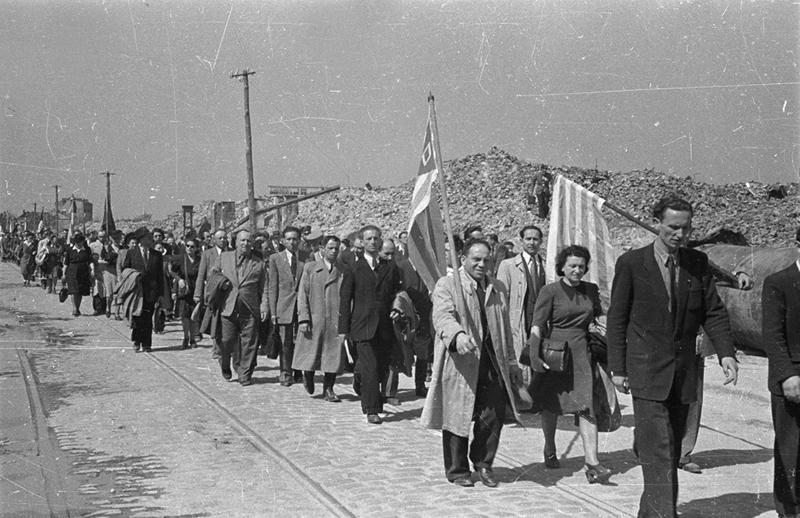 They resurfaced in the late 1950s (a period of intense emigration referred to as ‘Aliyah of Gomułka’), when following the denouncing of Stalinist crime, many Polish Yiddish writers, among them Binem Heller and Hadasa Rubin, grew disillusioned as to the true nature of the communist regime and left Poland for Israel. A climax of such writing came around 1968, when the last Yiddish writers – David Sfard, Kalman Segal, Lili Berger, Moyshe Shklar, and others – left the country. In these moving poems, their authors once again go back to the centuries-long coexistence of Poles and Jews on Polish soil, which for Jews was a homeland and a unique place where Jewish life could have thrived and developed freely. These poems typically reference Jewish cultural contributions in the history of Polish statehood, often invoking instances of the highest sacrifice for the country. For the majority of their authors, the decision to emigrate was accompanied by a bitter awareness of a whole era of Polish-Jewish relations coming to an irrevocable end. For many of them, the ultimate fiasco of this millenium-old story, was perceived as a personal failure. Leaving their home, as Ruta notes, also meant painful farewells with friends and family, the soil under their feet, familiar landscapes, as well as the graves of of their ancestors. It glimmers in the window panes. And embrace it with love. So when precisely did Yiddish literature in Poland come to an end? Magdalena Ruta claims this happened at some point in 1968. Along with the departure of almost all authors writing in Yiddish, that year saw also the closing of the only Yiddish publishing house Idisz Buch (in early 1968), as well as the last issue of Idisze Szriftn, a monthly dedicated to literature, culture and arts (its last issue came out in the autumn of 1968). The only other remaining Yiddish-language press title, the daily Fołks-Sztyme was transformed into a weekly, with the Yiddish section gradually diminishing, while the Polish section grew (in 1992 it was transformed into a bilingual biweekly Słowo Żydowskie / Dos Jidisze Wort, it remains the only Yiddish language magazine in Poland today). In 1983, the book Fun Ash Aroysgerufn by Daniel Katz was the last Yiddish book to be printed in Poland in the 20th century. Post-war Yiddish literature may not have produced as many masterpieces, and at times it was overwhelmingly political, but it was also one of the last traces of Poland’s multi-linguistic and multi-cultural tradition. How Much Polish Is There in Yiddish (and How Much Yiddish Is There in Polish)?